Thirumalai Nayak Palace, erected in 1636 AD by King Thirumalai Nayak, stands second among the various tourist spots in Madurai. King Thirumalai Nayak, who constructed this palace as a focal point of his capital, anticipated the palace to be one of the grandest in South India. This masterpiece of art is a classic fusion of Dravidian and Islamic style. The interior of the palace is richly decorated and it outshines many of its Indian contemporaries in scale, but the exterior is more sober in design. This Mahal was constructed using foliated brickwork and finished using delicate stucco called chunnam to obtain a smooth and shiny texture. 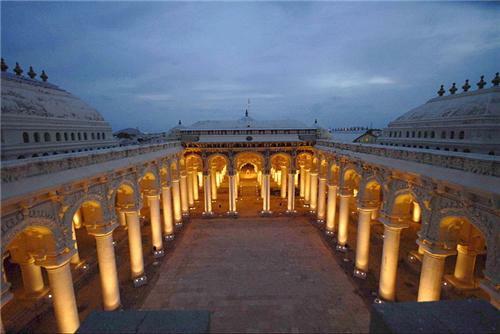 The courtyard is about 3,900 sq.m in area and is surrounded by huge circular pillars. To the west of the courtyard lies the Throne Chamber. The Throne Chamber is a vast room with a raised, octagonal auditorium. This room leads to the Dance Hall. Adding to this, the steps leading up to the hall were formerly flanked by two equestrian statues of admirable workmanship. The courtyard and the dancing hall are the center of attractions. There are 248 gigantic pillars, each 58 feet tall and 5 feet in diameter. The beautiful paintings; the wooden carvings; the Throne Chamber etc stands as a witness of the extraordinary talents of the Nayak Kings. The Octagonal dome which stands without any supporting girders proves to be an everlasting wonder. The building as it stands today was the main palace and the original palace was about four times bigger than the present structure. This palace is made of two parts, namely Swargavilasa and Rangavilasa. In these two parts, there are theatre, royal residence, shrine, pond, royal bandstand, apartments, quarters, and garden. Festivals like Chithirai festival, Navarathri, Masi festival and the Float festival were celebrated in the palace. The palace was utilized to house some officials of the judiciary and district administration. It is surprising to accept the fact that in-order to make bricks for constructing the Mahal, Thirumalai Nayakar evacuated a large area of land. This gradually became a huge pond. The annual float festival of Meenakshi Amman takes place here every year. This palace was destroyed by Chokkanatha Nayak, grandson of Thirumalai Nayak and the valuables were transferred to other places. During 19th century, Lord Napier, governor of Madras between 1866 and 1872 made several renovation works. Today, only the spacious rectangular courtyard called the Swarga Vilasam and a few adjoining buildings survive. Their tremendous scale evokes the magnificence of a vanished period. Above all, adding to the pride of Madurai this heritage monument was declared as a national monument after independence. This Mahal is currently under the control of Tamil Nadu Archeological Department.Thus it is maintained neat and clean for the flow of tourists. The palace is well equipped to perform Light & Sound shows depicting the story of Silappathikaram in both Tamil & English languages every day. Time: Visit this architectural wonder anytime from 9am to 5 pm. Show: Enjoy the “Sound and Light show” in Tamil from 6:45pm to 7:35 pm and in English from 8:00pm to 8:50pm. By Air: The palace is situated in Madurai. By air one can reach the palace by the Madurai airport. By Rail: Madurai railway station is located in the city. By Road: Tourists can reach the palace by bus, taxi, auto rickshaw and car facilities available in the Madurai city.